Hotel Attorney on Hotel Cap Rates. 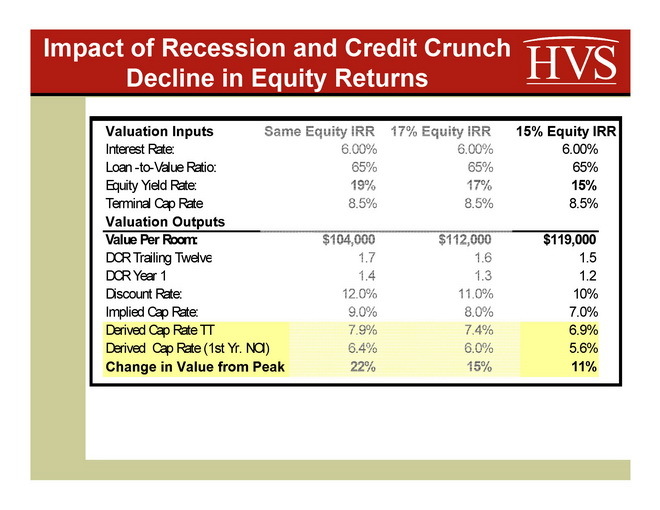 What’s happening to hotel cap rates, values and financing? Hotel Cap Rates are changing. What are hotel cap rates? What do the changes mean for your hotel buy or sell, hotel financing or refinancing, or next visit from the FDIC? What is the relationship between cap rates and equity return expectations? What is happening to hotel cap rates? How does that affect every hotel buyer or seller, hotel investor or lender and analyst? Meet the Money® — the annual hotel conference presented by JMBM’s hotel attorneys and their Global Hospitality Group — has just concluded another successful hotel finance conference with about 400 industry leaders gathered in Las Vegas to hear from hotel industry experts what is happening in our industry, and what is going to happen. Suzanne Mellen, Managing Director of HVS’ San Francisco office is one of the experts I look to in this area (smellen@hvs.com), and she gave us some great information that I want to share with you today. 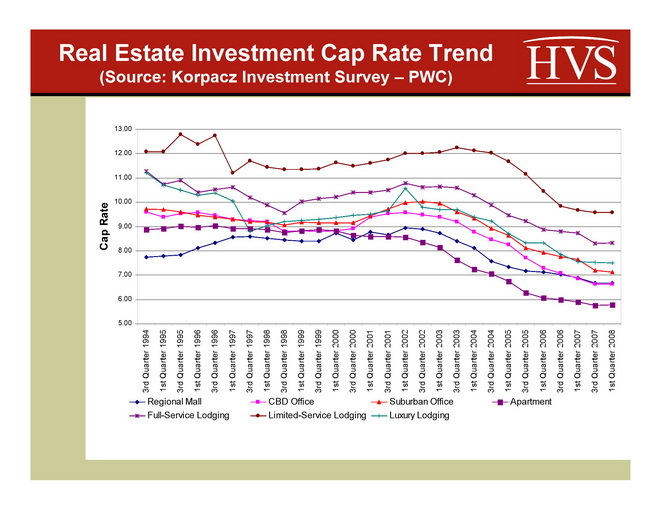 More recent articles on hotel values and cap rates The articles below include insights and data through March 2009. Hospitality Lawyer: Fortunes will be made . . . or lost . . . in the wake of The Financial Bailout Bill and the Panic of 2008. What happens AFTER the Bailout Bill . 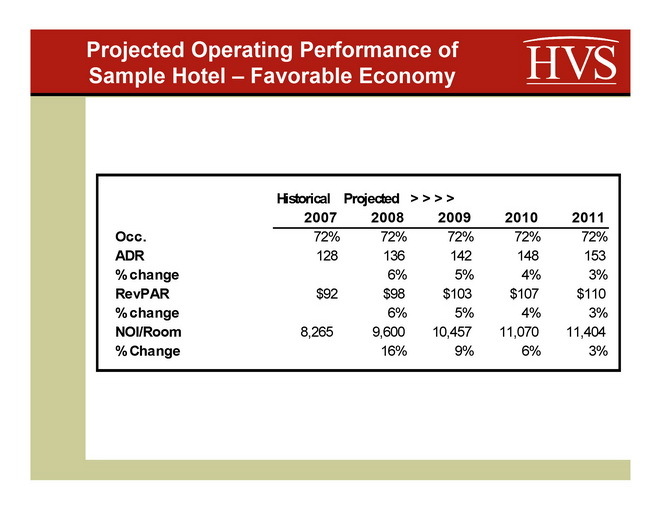 . .
Hotel Lawyer: New hotel data and revised predictions for 2009. Increased hotel loan stress, falling NOI and slumping values. It’s going to get worse before it gets better. Coincidentally, several blog readers have recently told me a little sheepishly that they sort of know what cap rates are, but could use a little refresher. So here is a one minute review that puts it all in street English (my apologies to the appraisers and financial analysts) and explains why cap rates are so important. And if you want to skip the basic explanation, and get straight to the hot information Suzanne Mellen gave us, just skip to the next section below. First, appraisers and many investors use “cap rates” as one of the benchmarks for determining a hotel property’s value — actually any property’s value — for purchase and sale, evaluating collateral for loan underwriting, or other investment purposes. Thus the implications of the market demanding a higher cap rate on are profound. If cap rates go up, as it appears they have, as a seller of an asset, you will receive a lower price. As a borrower or lender, the value of the collateral goes down. The cash flow may be the same, but the value is reduced when higher cap rates are required. And the final reminder: Cap rates and values move in opposite directions. 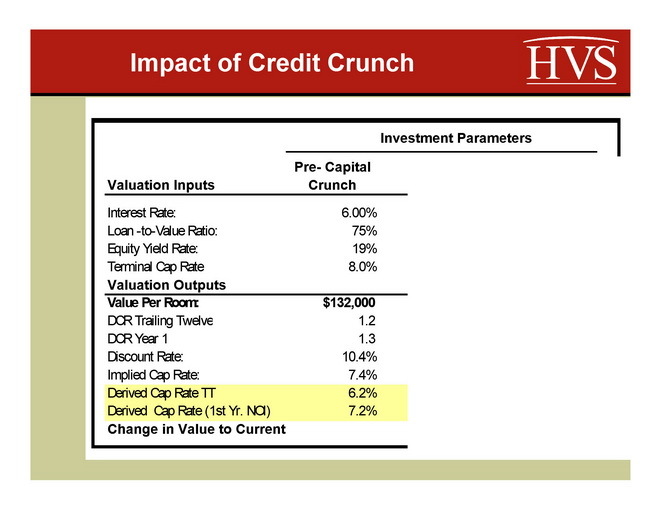 In other words, as cap rates go up, the value of the asset on the same cash flow go down. As cap rates go down, the value of the asset goes up on the same cash flow. Hotel Cap Rates: Where have they been? Where are they now? Where are they going? Suzanne Mellen’s presentation at Meet the Money 2008. All of the slides included below are courtesy of Suzanne Mellen, MAI, CRE, Managing Director of HVS, and were presented by Suzanne in the Industry Leader’s State of the Industry power panel on May 7, 2008. These are also her comments on the slides. A picture is often worth a 1,000 words, and this slide is one of them. It shows cap rates for various asset classes of real estate from 1994 through present. You can see how there has been a significant decline in cap rates and in discount rates since 1994. Changes in prevailing cap rates are significant. And the hotel industry is seeing a major shift in cap rates just since the beginning of the year. I think it was just about the end of January when several of the leading hotel consultants started increasing cap rates by 50 to 100 basis points, and it seems like that may be notching up again. 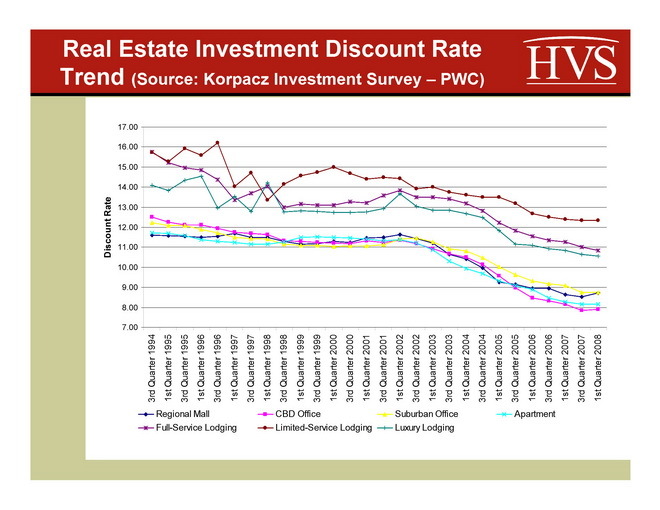 Note that the capitalization and discount rates derived from the PWC Korpacz Investment Survey are based on interviews with investors, as opposed to being derived from actual sales data. There is also a lag from when the data is compiled to when it is published, so one would expect that any upward movement in capitalization and discount rates may not be evidenced in the first quarter 2008 survey results. But the factors affecting hotel values, wholly aside from investor demand or supply, are very complex as shown in this series of slides from Suzanne, seeking to show the inter-relationship of factors like the credit crunch, lower LTVs, higher returns demanded by equity, and effects of a recession and recovery. 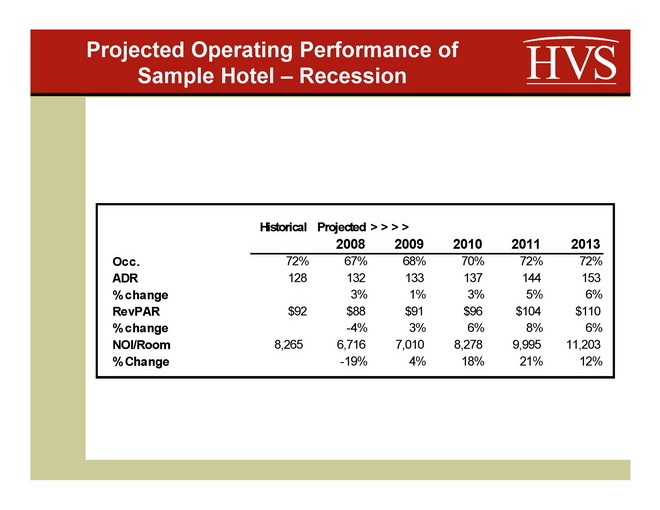 The following slide reflects the performance of a sample hotel as it would have been anticipated before the capital crunch – assuming no recession, and a moderate amount of upside generated by above-inflationary gains in average rate. Note that this case study is of a sample hotel, and should not be taken as a projection or commentary on any single hotel or hotel values at large. 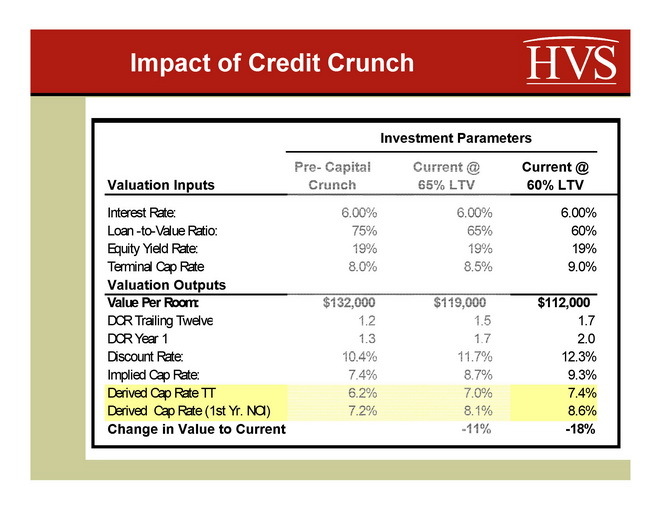 The impact of the credit crunch is evidenced in the following two slides. 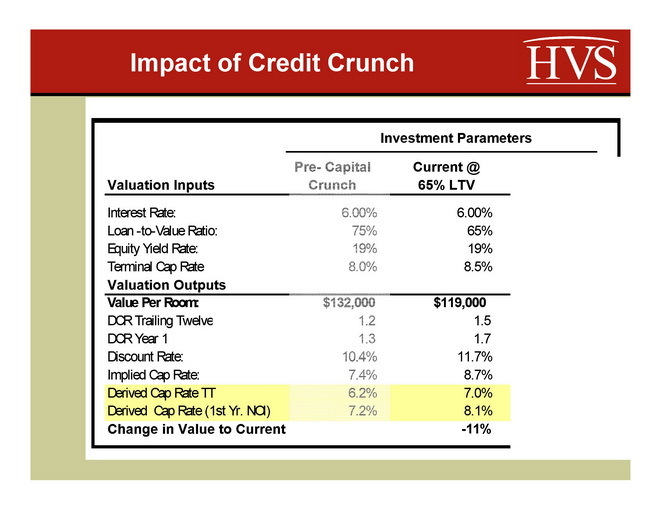 The first slide illustrates the value of the hotel assuming pre-credit crunch investment parameters. It is assumed that a sales transaction can be financed with a first mortgage at a 6% interest rate, a 75% loan-to-value ratio (LTV), and that the equity investor requires a 19% internal rate of return over an assumed 10-year holding period. An 8% terminal capitalization rate is used to project the sales price at the end of the holding period. The resultant value equates to $132,000 a room. Note the resulting overall capitalization rates of 6.2% based on trailing twelve NOI, and 7.2% based on first year forecast NOI. Now let’s see what the impact on value is from the lower LTVs that we are witnessing today. The same interest rate is assumed, given the recent decline in interest rates and floating rate debt. The equity yield rate is held constant, while the loan-to-value ratio is reduced to 65%. The terminal capitalization rate is increased by 50 basis points to 8.5%; there is a general consensus that terminal rates have increased now that we have moved beyond the stellar investment market of the last few years. The reduction in LTV from 75% to 65%, and a 50 basis point increase in the terminal capitalization rate result in an 11% decline in value, all other things being equal. A greater decline in the LTV, from 75% to 60%, and a 100 basis point increase in the terminal capitalization rate, results in an 18% decline in value, as evidenced in the next slide. Note the increase in capitalization rates from 6.2% to 7.4%, based on trailing twelve NOI, and from 7.2% to 8.6% based on first year projected NOI. Now let’s see what happens to the value of this sample hotel if a downturn in NOI is anticipated due to an economic recession. The following slide sets forth the anticipated change in NOI that is forecast over the next few years, through an economic downturn and a recovery. The sample hotel is projected to experience a 5 point occupancy decline and then a three year recovery to pre-recession occupancy levels. Now let’s see what happens to the value of this hotel from its pre-capital crunch peak. Assuming the more moderate 65% LTV, the total decline in value resulting from the lower LTV, higher terminal capitalization rate and anticipated decline in NOI due to the recession is 22%. One can see why there is a dearth of transactions, given the specter of a recession and the increased equity that must be raised by investors to consummate a sale. No one appears to be supporting the idea of a 22% decline in value, thus, the only variable that can change to close the bid-ask gap is the equity return. Assuming that the equity internal rate of return is reduced to 17%, the change in value is reduced to 15%. Given the general consensus that hotel values have only declined around 5% to 15% from their peak, the equity yield would have to decline to 15% to compensate for the lower LTVs and anticipated temporary decline in NOI. Investors with whom we spoke indicated that their equity return requirements have remained the same or have increased in the current investment environment, due to the perception of greater risk. Lower LTVs should lower equity return requirements, given the lower risk of reduced leverage, but it appears that it may take awhile for investor views (both buyer and seller) to catch up with the reality of the new investment paradigm. Jim devotes 100% of his practice to hospitality, representing hotel owners, developers and lenders. Jim leads JMBM’s Global Hospitality Group® — a team of 50 seasoned professionals with more than $87 billion of hotel transactional experience, involving more than 3,900 properties located around the globe. In the last 5 years alone, Jim and his team have assisted clients with more than 100 hotel mixed-use projects, all of which have involved at least some residential, and many have also involved significant spa, restaurant, retail, office, sports, and entertainment components — frequently integrated with energizing lifestyle elements. Jim is frequently quoted as an expert on hotel issues by national and industry publications such as The New York Times, The Wall Street Journal, Los Angeles Times, Forbes, BusinessWeek, and Hotel Business. A frequent author and speaker, Jim’s books, articles and many expert panel presentations cover topics reflecting his practice, including hotel and hotel-mixed-use investment and development, negotiating, re-negotiating or terminating hotel management agreements, acquisition and sale of hospitality properties, hotel finance, complex joint venture and entity structure matters, workouts, as well as many operating and strategic issues.